This post from from the blog "This Ain't Hell, but You can See It from Here" is about the latest attack on religious Christians and veterans. 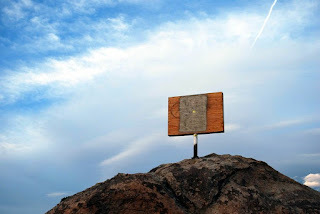 The ACLU is suing to have a veterans memorial--a cross that was placed in the Mojave desert by World War I veterans in the 30s--because it divides veterans of different creeds on how to memorialize their own sacrifice. This is incredibly offensive, on the part of the ACLU. Unfortunately I was not shocked to learn that the offended party was an National Park Service employee (not a veteran) who was hiking, came across the memorial, and initiated the suit to have the memorial replaced. As someone who works with veterans groups on a regular basis (I will be attending the VFW, AmVets, and American Legion conventions this summer), I can tell you that no veteran I know, of any (or no) faith, is offended by a cross left in the desert by a group of fellow veterans more than seven decades ago. This is nothing more than the continuation of the ACLU's campaign against God, and this time those who have sacrificed most for this country and its Constitution are caught in the middle.